Today we are super excited to announce a new feature called Dividers. I found and collected awesome web content into my bags, is there a way to organize them flexibly? Our answer comes with the dividers feature. By adding custom dividers to your bags, you can organize bagged web content into sections, steps, categories, weekly, groups, and so on. Here is an simple guide of how to use it. Hey, the holiday season is around the corner! While you are busy putting up Christmas trees and shopping for gifts for family and friends, BagTheWeb is working on another update to provide you with an improved Hashtag function and three other new features. Here is a brief introduction of these cool things. The new hashtag feature is more powerful than the old one. Now it can (1) help you organize your bags, (2) help you explore other people’s bags, (3) make the whole system smarter. – A new bag description field that allows hashtagging. 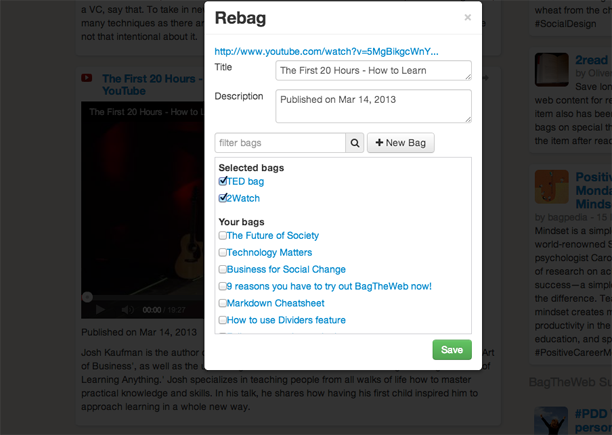 You can add hashtags by editing the bag description field even before publishing your bags. – Recommending bags with hashtags. If you are updating bags you created a while ago, you can recommend them to your followers with hashtags that describe the newest links you are adding. You can also use hashtags to recommend bags created by others. – Commenting on bags with hashtags. The comment field also allows hashtags now. If you see a bag that do not have appropriate hashtags yet, you can add hashtags to it via the comment field. This way, you “push” this bag onto the public hashtag page and make it easier for other users to find. – Filter by hashtags. 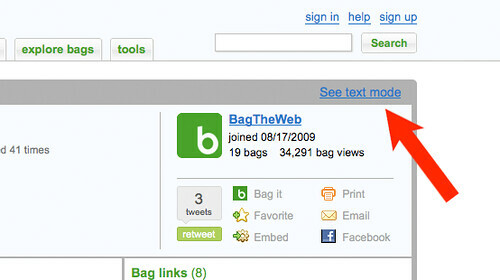 Now you can see a “filter by hashtags” button on all users’ bagspace pages. 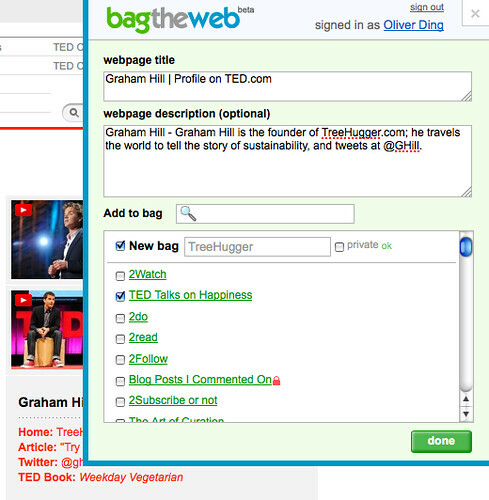 You can click this button and choose a hashtag to filer bags users created and recommended. 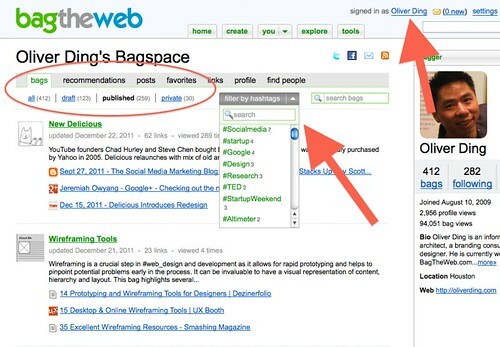 On your bagspace, the “filter by hashtags” button can be found on the All Bags page, Draft Bags page, Published Bags page, Private Bags page, Recommendations page, and Favorites page. – Improved public hashtag page. A public hashtag page now has two new choices: (1) “tags that may be related” at the sidebar; (2) a personal hashtag section. If you click a hashtag from one user’s profile, you will see three sections: “by all”, “by this user”, and “by you”. – Two groups of hashtags on profile page. We separate the hashtags you have used into two groups: (1) Hashtags used on your bags, and (2) Hashtags used on others’ bags. 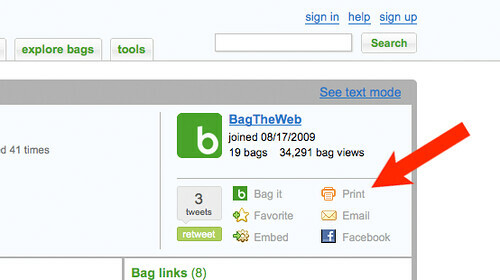 The newly added Links page under your bagspace is a private page like Favorite page. Only you can see this page at your bagspace. The Links page displays all links you bagged under four categories: all, draft, published, and private. The Links page has two view modes. 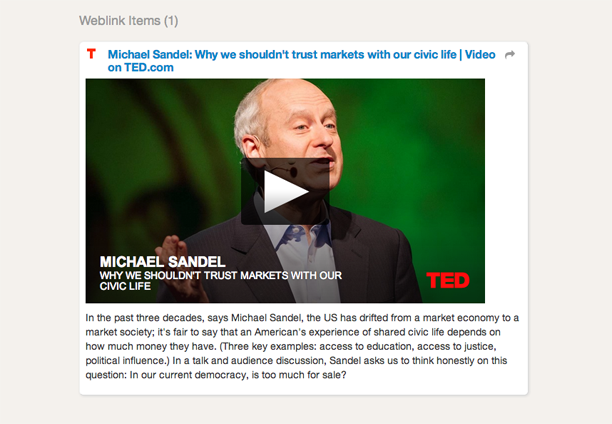 The default mode is Simple view which only displays Links’ titles and dates. The Expand view adds link’s description and shows the titles of bags where the link resides. The Links page allows users to Export links as a HTML file. Also, users can search for links there. Even without signing in to our website, you can now see a text-only mode of a bag page. 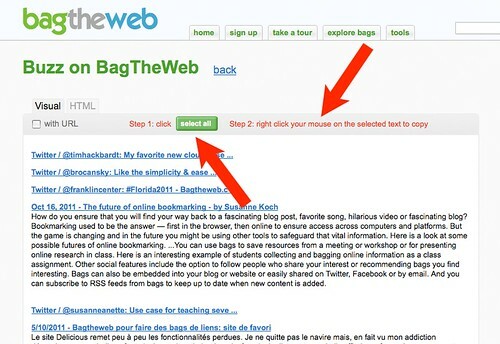 The text-only mode allows you to copy visual or HTML format of all links within a bag. Then you can paste these links to your blog, text file, email edit box or other files. The Comment button at the right top corner of a bag page has been replaced by a Print button. Now you can print all links within a bag. If you want to make the world greener, you can use this button only when you have to do it. For example, if you build a bag for your trip, it’s still useful to have a paper copy of it in hand to view the information while you do not have web access. OK, that’s our introduction. Even the new features seem useful, we still want to see how much you like them and thus are eager to hear your feedback. You may want to check out the following bags to see screenshots. (3). How to create hashtags on BagTheWeb? 2011 is a wonderful year. Thanks to all of you for staying here with us through the year. We have received many warm thank-you messages from you and learned a lot from you. We are working together to make the web more useful for the world. 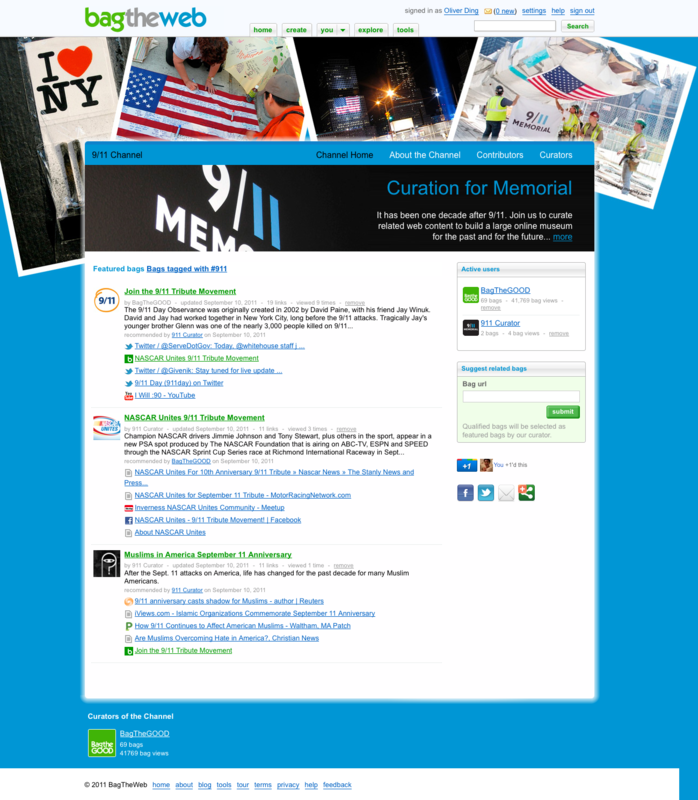 Today, we are glad to announce the launch of our 9/11 Curation for Memorial Channel. This day marks the tenth anniversary of the shocking 2001 attacks on the World Trade Center in New York City. We have reached an important milestone. During the past decade, people talked, debated, and thought about the changes the world is experiencing. These conversations brought tons of articles, photos, videos, presentations, tweets, and other types of contents on the Web. Social network websites are being used as gathering places for public memorial of 9/11. People are coming together to pay tribute to the victims, share stories, and bear witness to the tragedy on these sites. So, what’s the most convenient way to curate these fragmented materials? Can we weave a 9/11 Web together? We believe that collective social content curating efforts will build a “good web” where contents are better interconnected, easier to find, to share and to use. And we are excited BagTheWeb is part of this powerful trend. The 9/11Curation for Memorial Channel aims to provide you with an easy way to collect, preserve, present, and share the history of September 11, 2011 and its aftermath. 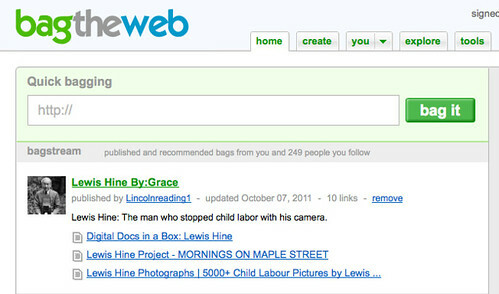 You can use “bags” to curate 9/11 related web contents from your personal angle, and then submit your bags to the channel. Are you a 9/11 Curator? Join us to build a large online museum for the past and for the future. Let’s weave a 9/11 Web together. Qualified bags will be selected as featured bags by our curators. It’s amazing what we can work on this together! If you don’t want to sign up, you can follow @BagTheGOOD who is the curator of this channel on Twitter.com and send him a tweet “I’d like to be a #911 curator on @BagTheWeb”. We will DM you the user name and password of “911Curator” account at BagTheWeb. Houston, TX, February 4, 2011. BagTheWeb, the leading social bagging community site, today released a new feature on its site called Education Channel, to better serve teachers, students, researchers, and lifelong learners. The main channel page showcases interesting bags used for education and active educator baggers as well. Education has always been a major application focus of the site. With bag’s powerful and easy to use features, teachers can collect teaching materials into bags for students to study and to assign homework. Students can build bags to collect information for their courses and to create projects. 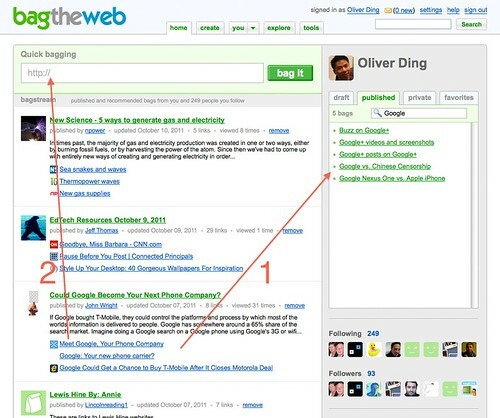 Researchers can bag what they discover from the Web and share knowledge with colleagues. Lifelong learners can keep their passion on interesting topics by bagging towards a personal knowledge base. Recently, some teachers and students at Abraham Lincoln Elementary School in Oak Park, Illinois, started using bags for their reading projects. 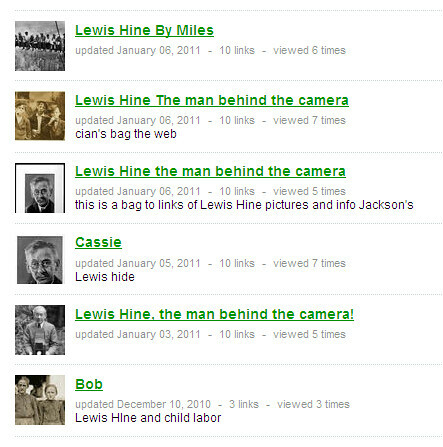 A group of fifth-grade students were asked to build bags collecting webpage links about social photojournalist Lewis Hine and embed them into their blog pages with a short essay to reply questions on Lewis Hine. “Emerging technologies promote changes in the process of human learning. Social networking tools bring us a new learning environment and rewire our brains. We are excited to add a technology piece to help. It is good to know that even fifth-graders are building and using bags for their studies. Understanding is important in the process of human learning. Our tool is designed to help understand the meaning of information instead of remembering every piece of information,” said Gordon Wu, CEO of BagTheWeb. 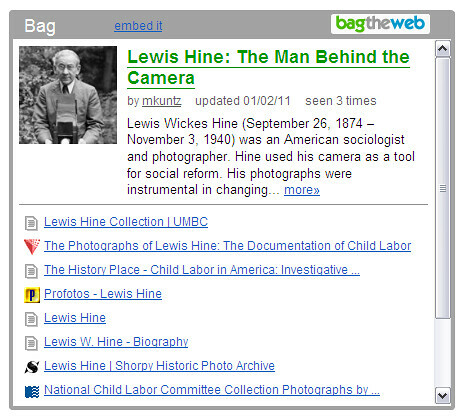 The new Education Channel allows users to submit education-related bags and BagTheWeb’s curators will feature them on the channel after review. Also, active educators will be featured there. Via the Education Channel, these contents can reach a broader audience and thus benefit the entire education community.